The near-mythical ‘Indian summer’ has suddenly become a reality. Londoners are shedding their macs and leaving their brollies at home, flowers have been tricked into blooming all over again and Edgware Road has sold out of ice cream. So, I thought it would be a good time to tempt you with this Mediterranean supper. I cooked it the other night while trying to conjure up a balmy, Italian evening in the midst of a rainstorm. Cook it tonight, and it’ll be the real deal. Put on something linen, crack open a bottle of chianti and take supper outside. Start by squeezing the sausage out of their skin and rolling them into little balls – you should get around three from each sausage. 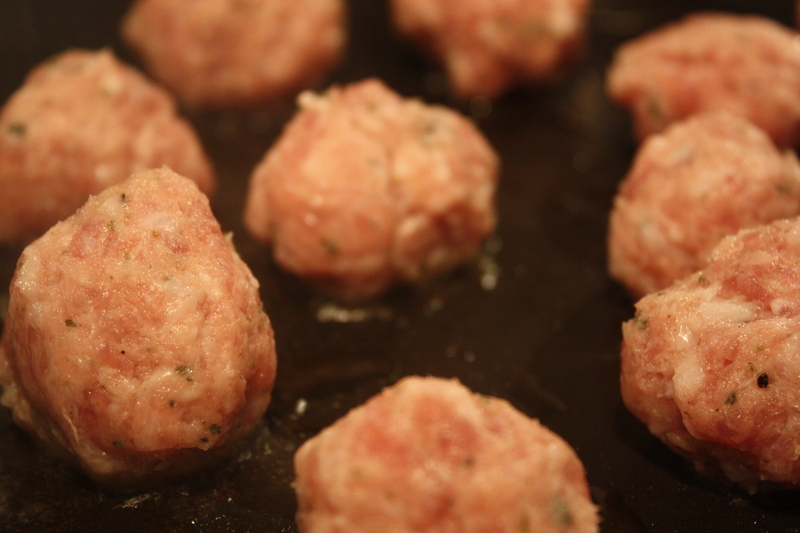 Fry them in extra virgin olive oil until the outsides are nicely browned. Use a slotted spoon to take them out of the pan and put them to one side. 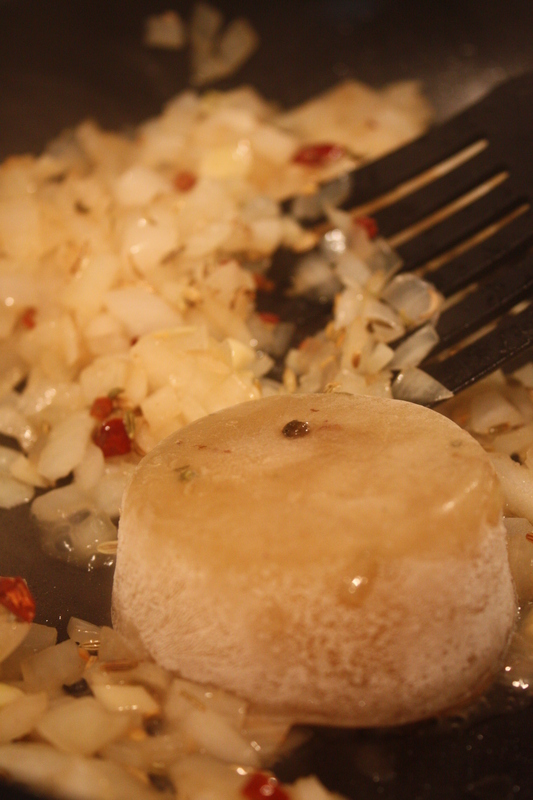 Next, fry the chopped onion and garlic in the sausagey oil in the pan. Now is a good stage to season. If you’re being sensible, maybe a little oregano and fennel. If you’re being Tom, then a handful of dried chillis. Add the stock and then the tinned tomatoes. As you can see, I was using homemade stock I’d frozen in a muffin tin, so I awarded myself extra brownie points for coming over all domestic. Get everything really hot and bubbly, and keep it like that for about five minutes, so the tomatoes and stock start to reduce. 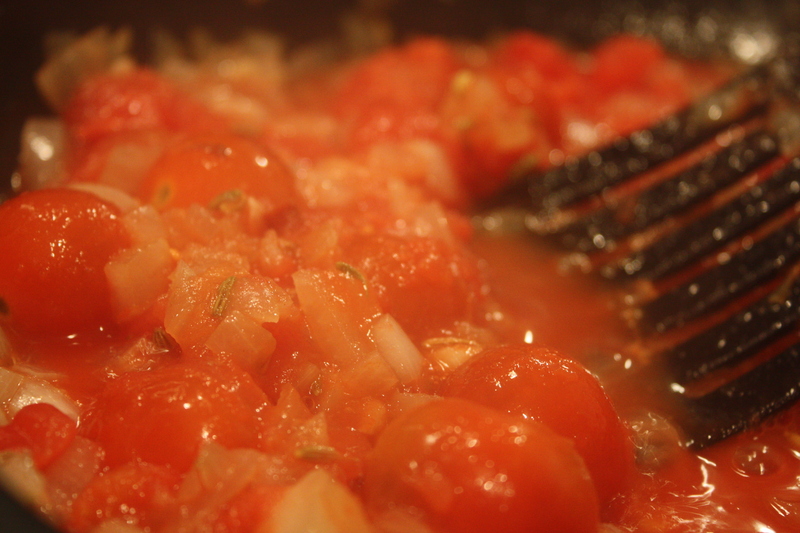 (Incidentally, I threw in some cherry tomatoes at this point, because they were in the fridge – it was quite nice). 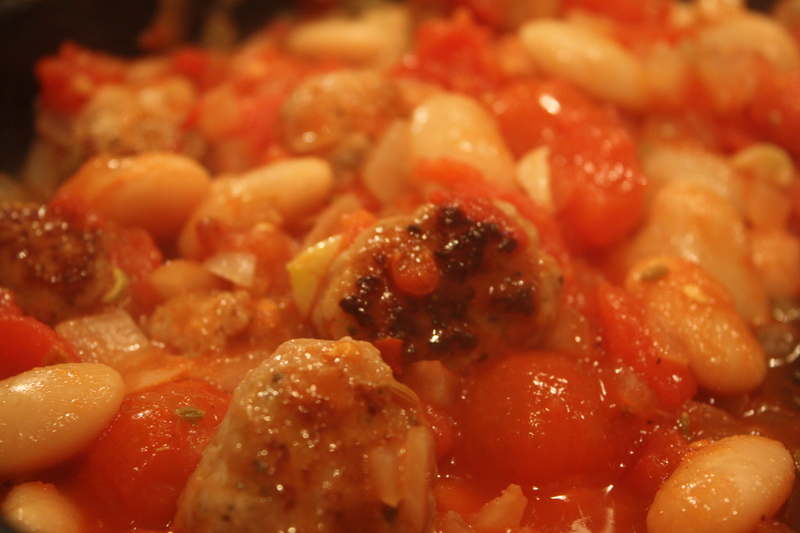 Turn down the temperature a little, and then pop the berlotti beans and sausage balls back in the pan. Cook gently for about 10-15 minutes. Three minutes before serving, tip your greens into the pan, and stir, so they all start to cook from the heat of the sauce. 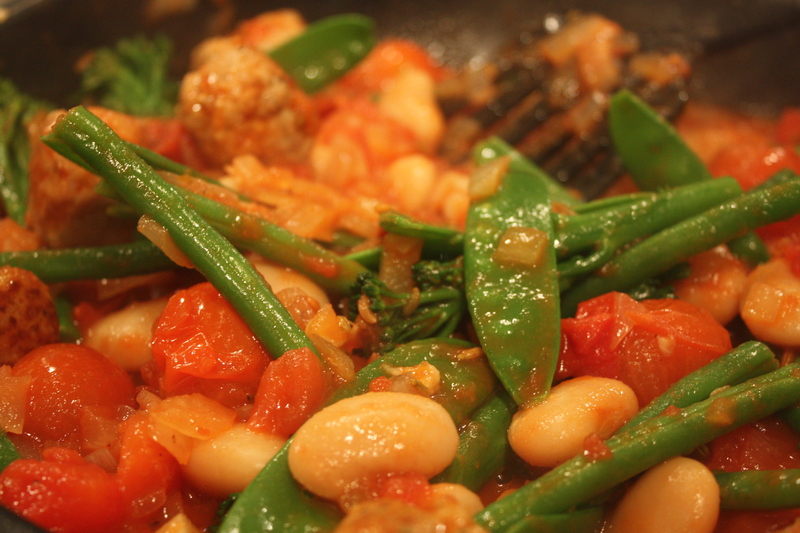 The last thing you want is green, wilty beans though, so do leave it right until the end. Open a bottle of some sort of Italian wine and enjoy. Mmm, looks good. Could definitely do that with veggie sausages! Great recipe! I’d throw on my linen, if the rain would ever stop here! mmmmmmmmmmmmm! Wish we were getting some of that late summer weather in Scotland though. If it’s any consolation, it’s gone now. Back to root vegetables, and ‘hearty’ stews!